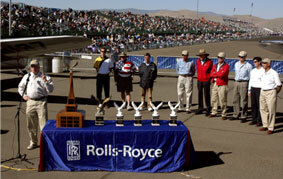 Aircraft owners and restorers will compete for the prestigious Neil A. Armstrong Aviation Heritage Trophy (photo). The Trophy resides in the Steven F. Udvar Hazy Center of the Smithsonian National Air and Space Museum in the Washington D.C. area. The "People's Choice Award", presented by the National Aviation Hall of Fame, is awarded to the aircraft that receives the most votes by the general public attending the Invitational. Each aircraft is judged on its technical merit and how well it represents the condition of the aircraft early in its career. 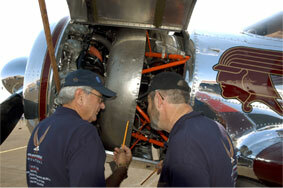 The competition is open to aircraft 45 years or older which have been restored to its present condition. The aircraft participating in the Invitational are judged by a five-member team that include representatives from the Smithsonian National Air and Space Museum's restoration team at the Paul Garber facility. Click here for a detailed look at the Judging Criteria. Those who plan to attend the National Aviation Heritage Invitational are REQUIRED to read this document prior to participating. The Neil A. Armstrong Aviation Heritage Trophy competition is designed to encourage the preservation of aviation history through the restoration of vintage aircraft. This endeavor is a joint effort under the auspices of The National Aviation Hall of Fame, The Reno Air Racing Foundation, and the Smithsonian National Air and Space Museum. "People's Choice Award" is open to all aircraft, in all classes. The recipient of this trophy is determined by popular vote. The viewing public is invited to participate by filling out one preference card for the viewer's favorite aircraft entered in the competition. APPLY NOW TO BE A PART OF SUCH EXCITING AVIATION HISTORY!